I can't believe I let almost two weeks go by without mentioning this. Detective Comics, which Batman has appeared in for 70 years, will, for the next 12 months, not star Batman. It will, instead, focus on Kate Kane, the new Batwoman, who made her debut a couple of years ago in the pages of the astounding weekly comic 52. 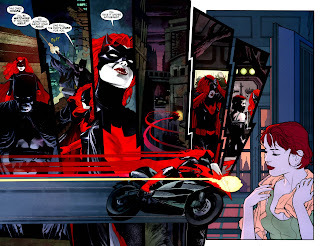 Batwoman has a bad reputation amongst comic book skeptics because she is a lesbian. Now it's not that said comic book skeptics are a bunch of homophobes, though a case could certainly be made for such, it's because being a lesbian was all that was known and publicized about Batwoman. Comic book guys are generally opposed to diversification of a superhero universe, not because superhero fans are opposed to change (they are), but because diversification simply for diversification's sake gets kind of annoying, especially when they do it in bulk, as they did with Batwoman a couple of years ago. 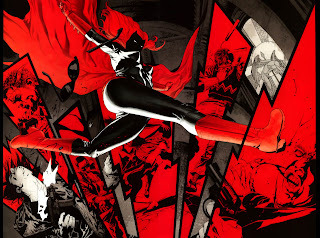 So when Batwoman was rumored as a new mini-series to be worked on by Greg Rucka and JH Williams III, fans were divided, and then when she was announced as taking over Detective instead, shunting Batman off for the first time in 70 years, the divide became more divided. On the one hand, why is a character who is "clearly" just a publicity gimmick getting so much attention? On the other hand, it's Greg Rucka, who's written a good run of Batman comics in the past, and is also well-known for his crime fiction, and was one of the writers of 52. 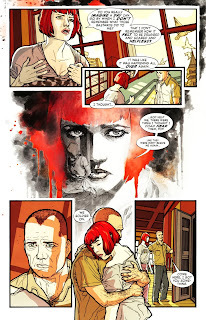 Furthermore, it's JH Williams III, acclaimed artist of Promethea and Desolation Jones. That's Alan Moore's Promethea and Warren Ellis' Desolation Jones, folks. So it's a classic case of whether you read comics for the characters or the creators. Although there's an overlap for me (I would probably never read a Neil Gaiman Iron Man, for example), there are some creators who will instantly get my attention. Jim Williams is one of them. 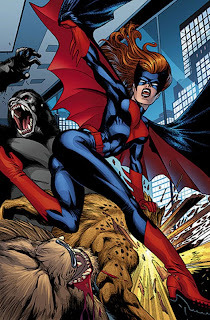 Besides, it's not that Batwoman is a bad character. She's just a cipher, and it so happens to be that the one thing that is known about her reeks of publicity stunt. I trust Rucka, a pretty damn solid writer, to flesh her out and give her a personality, because, contrary to what a lot of comic fans believe, "lesbian" is not a personality trait. It's a sexual orientation, and personality is deeper than that. On the whole, I trust Rucka to handle it well. The red and black color scheme is great; it, combined with the shape of her Bat-emblem, harkening to Batman Beyond, which you should really watch if you haven't. I like the bat-wings, too. Wait, are we talking visuals now? Then let's talk about JH Williams III. My three favorite artists, in order: George Perez, JH Williams III, and Chris Ware. George Perez is the master of drawing beautiful things to serve the story, Chris Ware is the master of experimentation with the art form, and JH Williams III is the perfect, perfect mix of both. 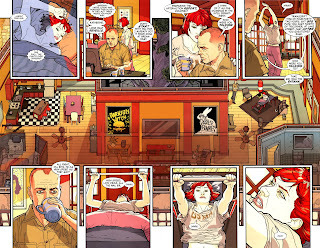 Williams likes working with double-page spreads, so here, you've got page 2-3 of his first issue of 'Tec. Note the changes made to Kate's palette. Her hair is red, which provides a better overall balance throughout the entire scheme, and her skin is pale white, which contrasts very well with the black and red. Also note Jim's change to Batwoman's costume: a very subtle change that provides more realism and believability in this genre that, for some reason, demands it even when its very premise foregoes it. I won't tell you what he changed with her costume. It's right in front of you to compare and contrast. Once you notice it, I'm sure you'll find it brilliant. I'm just gonna talk about its layout instead. There's something about the way Jim lays out his pages that really gets the feel of what the characters are doing. We see Batwoman from Rush's eyes (Rush is the thug), so Jim employs this semi-circular layout for the top half, providing a spinning feeling as Rush focuses on Batwoman's sinister grin. Then Batwoman makes her move and the panel is long and narrow, really constricting the space for Batwoman's kick and focusing on it, the same way anyone would if something threatening were coming their way all of a sudden. Let's go to the next page. 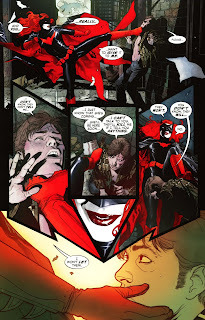 Without commenting on the layout here, I just want to point out that it's pretty incredible how Williams manages to have Batwoman shift from threatening to caring in the span of one panel. Williams also employs a technique that he's used since the last few issues of Promethea, where he shifts styles for different subjects. 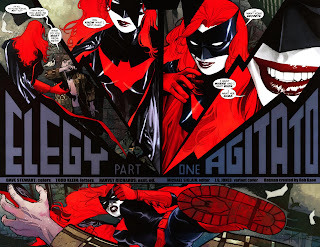 When batwoman is in her civilian identity, the colors are flatter, the outlines are inked bolder, and it doesn't even look like it's clashing when the two styles are put on the same page. Plus, he can handle quiet moments really well, too, making the scenes where Kate is in her civilian identity a delight. For the final treat, I'd like to show you this page, where Batwoman attacks a gang. Note how incredibly dynamic it is. Each lightning bolt has a close-up of Batwoman hitting a gang member, with the exception of the first and last, which just has the gang members getting hit by Batwoman's feet. I tried making comics, my friends, and I have to say: something like this is not easy at all to pull off. You might think he's saving time by drawing just one Batwoman instead of multiple in separate panels, but I can assure you that the time it would have taken anyone else to draw the requisite number of panels is most likely the amount of time it took Williams to even conceptualize and draft his version. Plus, this looks prettier. When people ask me why I still buy comics, JH Williams III is my main reason, because none of this looks so good as it does on paper. Trust me. The story's not perfect; it starts off slow and establishes what needs to be established, and the cliffhanger is kind of meh, but the characterization is excellent and provides for great visuals. Comics are a visual medium, and I can forgive an imperfect story if it gives us excellent visuals, and the next year of Detective will be jam-packed with great visuals and a solid story to carry them all. The best Batman book on the market doesn't even feature Batman, folks. Go buy Detective Comics #854, open it up, smell it, and then marvel at the awesomeness of JH Williams III. Then go buy yourself some Promethea, because he's just that awesome.